This pedal bar seat is a fantastic industrial styled beauty that looks fabulous in the kitchen and obviously behind the bar! It has a lovely vintaged leather seat that really is the business. The seat swivels a little bit, the height of the seat is non adjustable, it is set at a standard 76cm which is perfect. The pedals are fixed for safety, they are authentic in feel and size and with the bicycle chain fixed too there is no need for bicycle clips! The base is very strong as it is made of tubular steel, and the base is wide so it is very sturdy too! So if you’re looking for something fun, fashionable and funky then look no further! Measures H76 x W41 x D60 cm, seat height is 76cm. Please do take a look around our on-line store as there are hundreds more wonderful items to be seen. 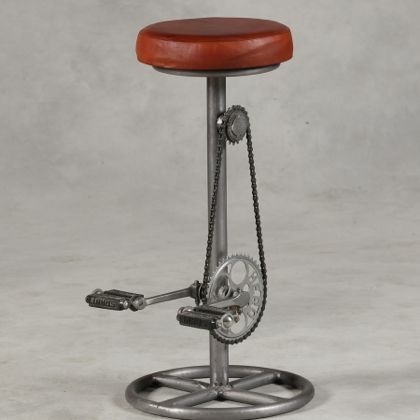 If this industrial pedal bar seat is not what you are looking for, we have a lavish selection of gifts, mirrors, French furniture, lamps, chandeliers and vintage style home accessories that will inspire you. Updating a bedroom perhaps? Starting afresh in an exciting new home? Revamping a living room? Or simply adding refreshing feature accents to your home, we are your one stop stylish interiors shop!